A relatively young dispensary − LALA LAND LOS ANGELES has already acquired a reputation of being a medical cannabis provider with an excellent assortment and customer service. With numerous deals, special offers available every day and an incredible selection of high quality marijuana strains every customer can find something to his or her liking here. The friendly staff at LALA LAND LOS ANGELES is always happy to assist you with the matter of choosing the right medication that will address your needs best. Although being a small dispensary, the company provides an incredibly large selection of products. The assortment includes over 60 various grades of Indica, Sativa and Hybrid as well as numerous edibles, topicals and concentrates. 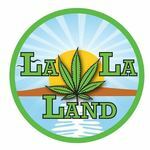 LALA LAND LOS ANGELES focusing on providing most rare and exclusive grades of medical cannabis.